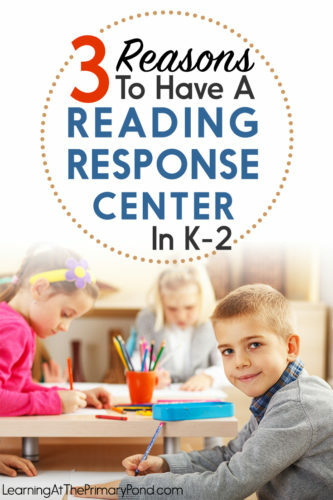 For a long time, I didn’t have a literacy center devoted entirely to reading response. I wanted to have my kids write about the books they read on their own AND the books that I read to them. But I wasn’t quite sure where it could fit into our day. Should it be part of the independent reading center? Well, not really, because that takes away from actual READING time. Should it part of the writing center? Maybe, but I want the kids to work on other types of writing too. Should it be a whole class activity, following a readaloud or shared reading? If I have time, absolutely. But sometimes I don’t. And if I give the kids all the same reading response task to work on, they usually finish at different times. Finally, I ended up making reading response its own center. It seemed like the best solution — it makes reading response a priority, but it fits conveniently into the literacy centers block that I already have scheduled in our day. 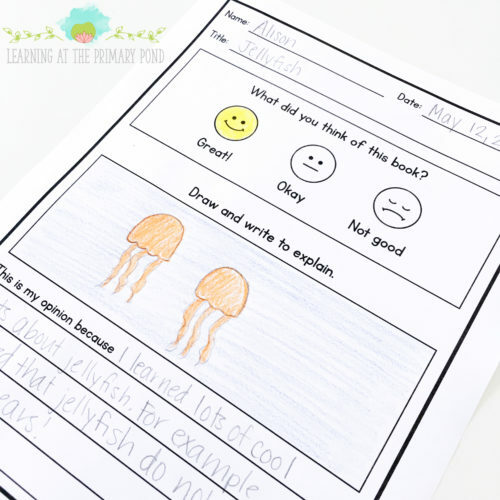 Have you thought about adding a reading response center to your literacy rotations? If not, here are 3 reasons why you might want to! 1. 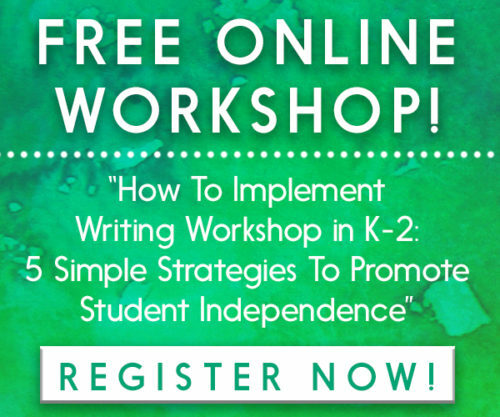 Reading response incorporates comprehension AND writing — a double whammy! 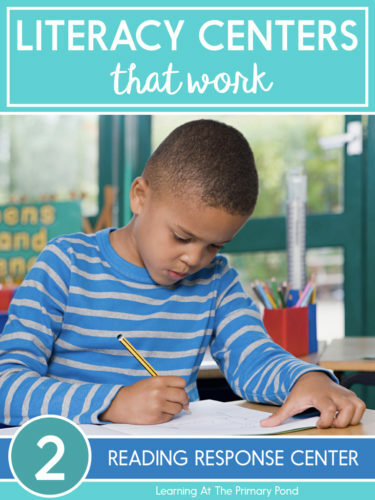 You really do get “a lot of bang for your buck” with reading response activities. The very act of thinking about a text in order to write about it helps develop kids’ comprehension skills. You also get to see how kids are doing with their reading/listening comprehension AND their writing skills! 2. 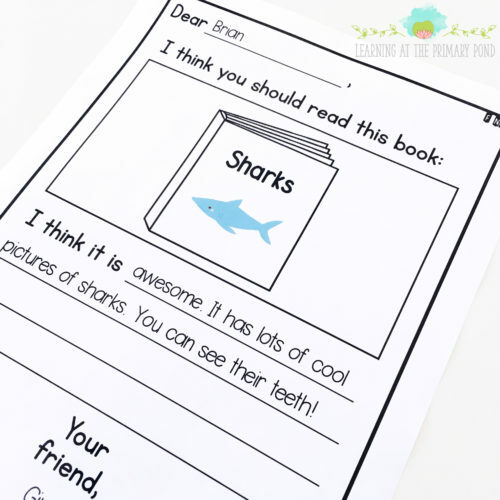 Reading response activities can be super fun and motivate kids to read MORE! Do you know how EXCITING it is for a 5, 6, 7, or 8-year-old to get a personal letter from a friend that recommends a book? Well, spoiler alert — it is SO fun for them! Having kids recommend books to each other creates this amazing buzz and energy for reading in your classroom. 3. If you lump reading response in with independent reading, it’s really hard to get kids to find a true balance between reading and responding. I work with K-2 kids, and they take a loooooong time to write. Sometimes it can be tempting to have kids respond to books that they’re reading. It seems like a good way to hold them accountable for independent reading, right? And it can be. 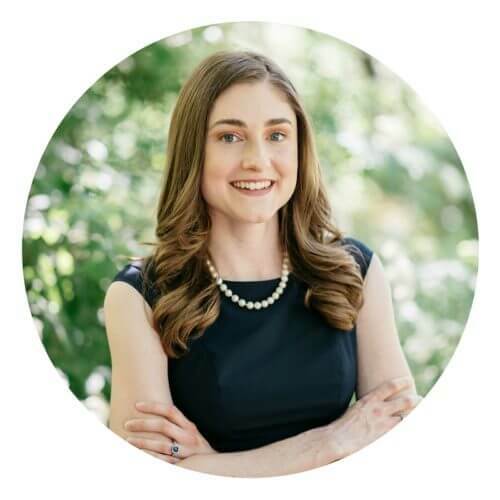 BUT there’s really no good way to ensure that the responding doesn’t eat up too much independent reading time — unless you separate the two activities and dedicate time to each one. I set up my centers rotations so that kids typically visit the reading response center right after they visit the independent reading center. This ensures that they have time to read AND respond! How do you incorporate reading response into YOUR classroom? 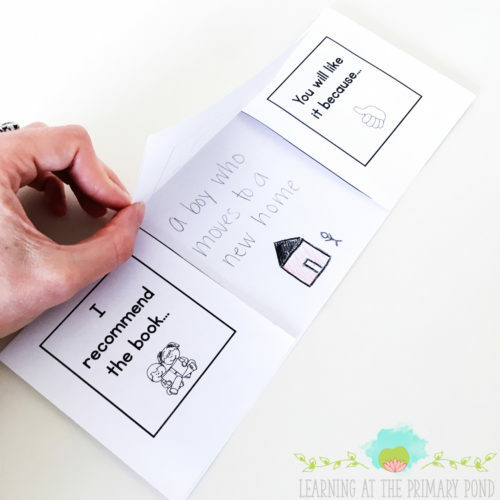 If you’re looking for some reading response activities for kindergarten, first grade, or second grade, check out my reading response packs below! Hi there, I was wondering if this means that you now have 6 different literacy centers? We do Daily 5 in our classroom. During read to self kids usually finish reading their books pretty soon and get distracted. I was thinking to include very short exit tickets for reading responses to hold them accountable. bUT I am afraid like you say that they take way too long to finish. I guess I could just try and see what happens and if it doesnt work make it part of my writing center.